According to Iowa State University economist Bob Wisner, if all these plants are built, they would use all the corn grown in Iowa. As oil prices continue their upward spiral, there is a call to convert millions of acres of food crops to fuel crops. In the U.S., ethanol plants are being constructed on a mass scale. In Iowa alone, 55 ethanol plants are operating or have been proposed. According to Iowa State University economist Bob Wisner, if all these plants are built, they would use all the corn grown in Iowa. With so many distilleries being built, livestock and poultry producers fear there may not be enough corn to produce meat, milk and eggs. Presently in Brazil, half of the sugar crop is now being converted to fuel, causing world sugar prices to double. 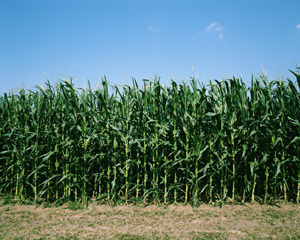 In Europe, 1.6 billion gallons of biofuels were made from food crops last year. Given the new demand for these crops, global donations of food grains are not keeping up with the world’s increasing starving populations. Meanwhile, researchers are attempting to perfect the science of “cellulosic ethanol” wherein instead of being made from grain crops, the ethanol is made more efficiently, and with less greenhouse gases, from switchgrass, hemp, plant waste and paper waste. The grain required to fill a 25-gallon SUV gas tank with ethanol would feed one person for a year. The grain to fill the tank every two weeks for a year would feed 26 people. U.S. taxpayers now subsidize the ethanol industry at a rate of 51¢ per gallon (a law in effect until 2010).